Hi! 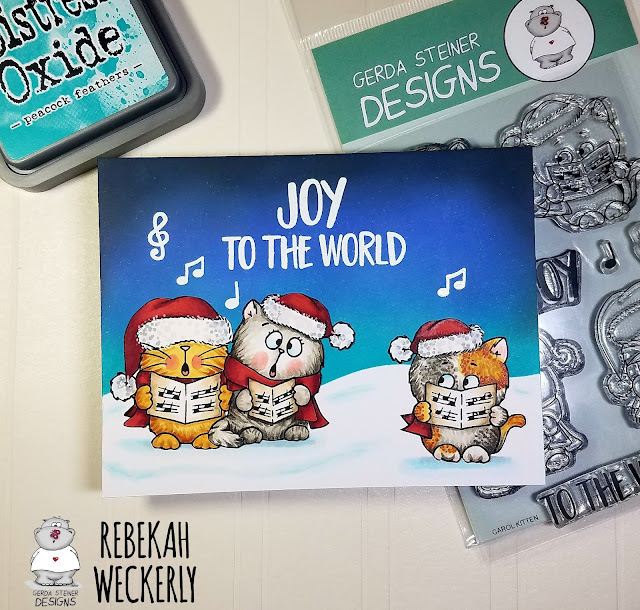 Its Rebekah here with you today bringing you a look at the NEW Carol Kitten stamps set! As a mother to five kids ranging in ages from 11 to 19, I quite frequently have someone rolling their eyes at me or giving me an annoyed glare. It could be because I have asked them to feed the dogs or take out the trash but a lot of the time it is because I have done something to embarrass them. That was the inspiration behind this card! I love the little kitty rolling his eyes at the two who are singing their hearts out! He looks to me to be very embarrassed by their rendition of 'Joy to the World'. It just makes me laugh! 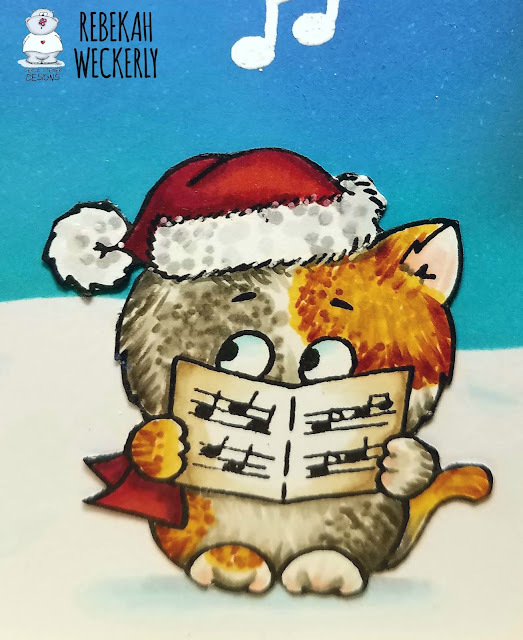 For this card I colored three of the four kittens in the Carol Kitten stamp set with Copic markers. I used both the flicking and dot techniques to create the look of fur. I created the background using Distress Oxide Inks. I masked off the bottom of the card to create snow drifts and added a few shadows in the drifts with Copic markers. 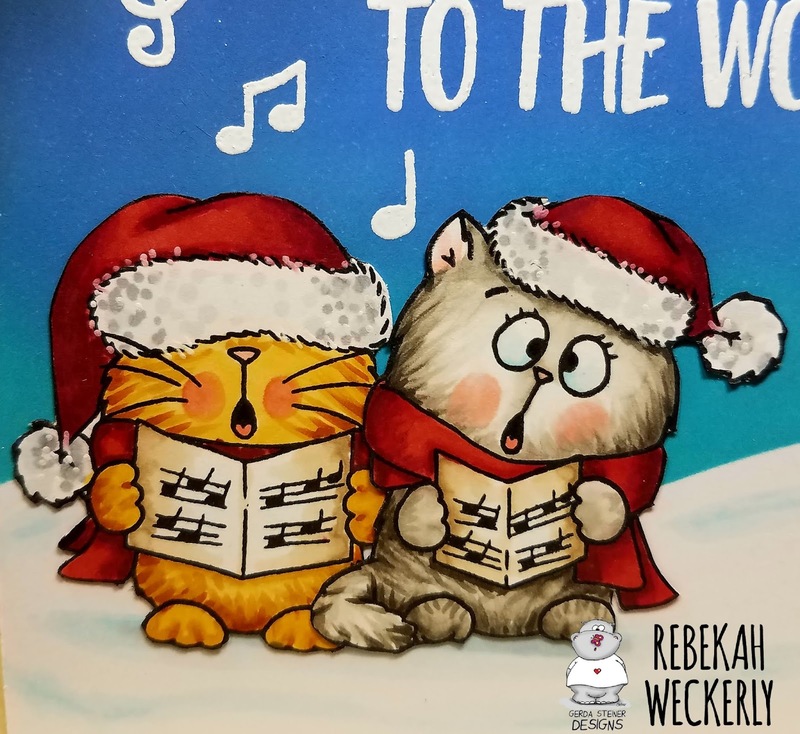 The sentiment and musical notes are stamped with VersaMark ink and heat embossed with fine detail white embossing powder. The Carol Kitten stamp set will be available in the Gerda Steiner store on October 2nd! It is a super fun set to color and I can't wait to see what YOU make with it!